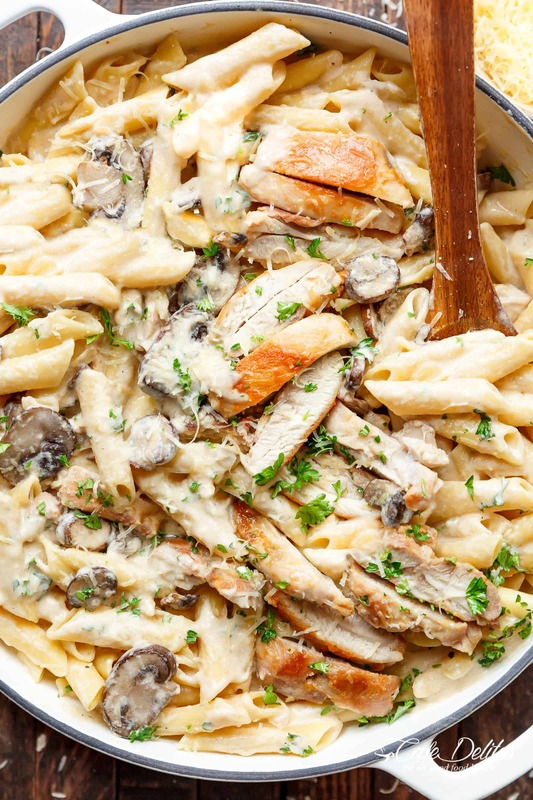 Creamy Garlic Parmesan Chicken Alfredo is all cooked in ONE POT! Ready and on the table in less than 20 minutes! Crispy golden seared chicken is mixed through a super creamy garlic parmesan Alfredo sauce! 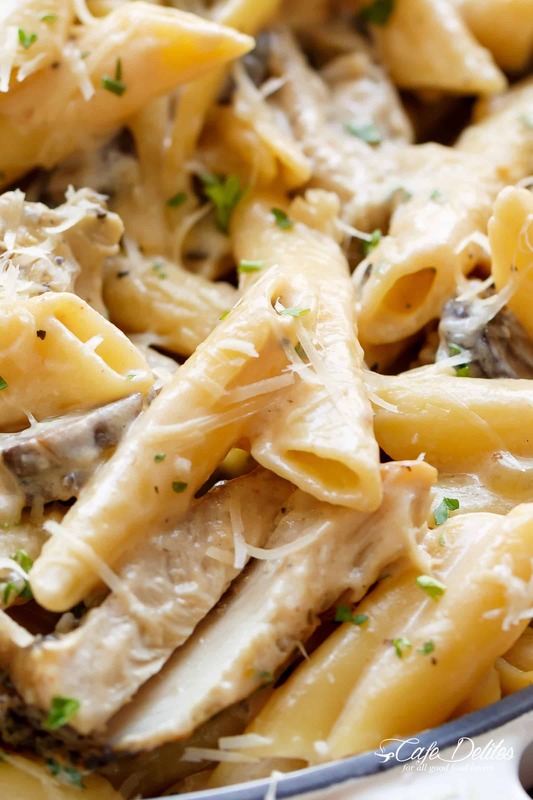 Our favourite Chicken Alfredo recipe with the pasta cooked right in! Perfect comfort food at its finest. Move over store-bought Alfredo sauces and even restaurant Alfredo. This chicken Alfredo recipe has the best homemade Alfredo sauce ever! SO MUCH FLAVOUR! This recipe is for those desperate moments! A throw-it-all-in-a-pot-recipe you can do in minutes! Just a simple pot and humble stove top needed. Sear chicken thighs (or breasts) first to enjoy the crispy golden texture through the creamy pasta, then remove them to ensure a juicy chicken pieces. You’re more than welcome to dice the chicken first, sear, then leave in the pot to continue cooking with the rest of the ingredients on from Step 2 in the recipe box (at the end of this post). Personally, I prefer golden and crispy chicken! There are three main steps to this recipe. CHICKEN → SAUCE → PASTA. The sauce I use includes wine. I love wine in this but you can leave it out all together if you wish. If using wine, please use a good quality dry white wine. I use a $20 bottle of Pinot Grigio in most of my recipes on this site, but a good Sav Blanc or Chardonnay will suit the favours in this creamy sauce. You can substitute the heavy cream (or thickened cream) with half and half or a reduced fat cooking cream to reduce the calories. You can also use evaporated milk depending on your dietary requirements. Using freshly grated parmesan cheese enhances the flavour and ensures the cheese melts through the sauce. Please don’t use powdered parmesan. The most important tip I have here is to remove the pot off of the stove when the pasta is just cooked al dente (firm to the bite). The sauce begins to evaporate quickly into the hot pasta while it’s resting or waiting to be served. How do you thicken your Alfredo sauce? The sauce in this recipe naturally thickens as the starch from the pasta is released into the sauce while cooking. If the sauce is too thick for your liking, add extra cream (or evaporated milk) in 1/4 cup increments until smooth and silky. If you LOVE Chicken Alfredo, TRY THESE! 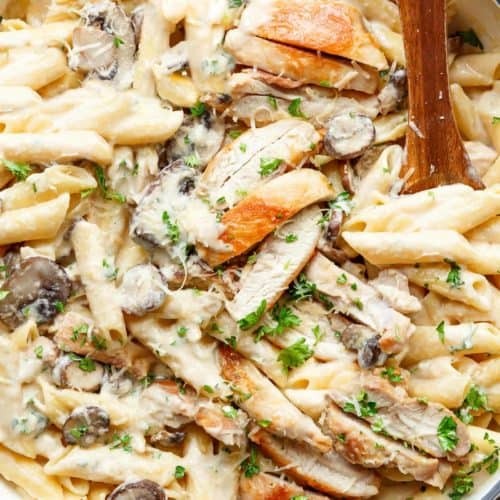 Creamy Garlic Parmesan Chicken Alfredo is all cooked in ONE POT! Ready and on the table in less than 20 minutes! 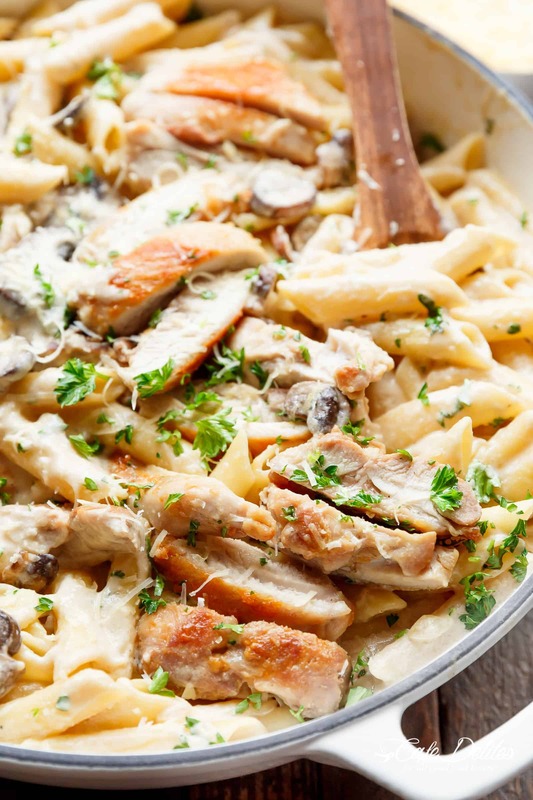 Seared chicken is mixed through a super creamy garlic parmesan flavoured pasta with white wine and mushrooms! A favourite Chicken Alfredo recipe! Heat half of the oil in a large pot over medium-high heat. Add the chicken thighs and sear on both sides until golden brown and cooked through. Remove chicken and set aside. Add the remaining oil in the pot. Fry onion until transparent, stirring occasionally (about 2 minutes). Sauté the garlic until fragrant (30 seconds), then add in the white wine and allow to reduce to half (about 4-5 minutes). Add the mushrooms and cook for about a minute, while stirring occasionally. Pour in broth and 1 cup of cream (or evaporated milk); season with salt and pepper. Bring to a gentle simmer then add the pasta. Mix well, reduce the heat to a slow simmer while stirring occasionally, until pasta is al dente (about 15 minutes). Stir in the parmesan cheese until it melts through the sauce. Remove from heat immediately and slowly add in 1/4-1/2 cup remaining cream if sauce it too thick for your liking. Adjust salt and pepper to your taste. You can dice the chicken first, sear, then leave in the pot to continue cooking with the rest of the ingredients on from Step 2 if you wish. Use a good quality dry white wine. Pinot Grigio, Sav Blanc or Chardonnay. Substitute heavy creamy (or thickened cream) with half and half, light cream or evaporated milk. If the sauce is too thick add hot water in 1/4 cup increments until smooth. Remove the pot off of the stove while there's still a bit of sauce in the bottom of the pot and the pasta is cooked al dente (firm to the bite). The sauce begins to evaporate quite quickly while it sits waiting to be served, and as you mix it through adjusting salt and pepper. Seriously bookmarking this forever ..so delicious! I use fat free half and half to lighten it up. Is that the reason my sauce always breaks? It still tastes delicious, but doesn’t look as good. Love your recipes!! This is a great idea for a party. Yes, with this you will double all the ingredients. It will work out the best. It would be a great idea to take sauce to the party. That will help keep it moist. Thanks for the comment and for following along with me!! I just made this recipe tonight and it is hands down the best home made Alfredo sauce I’ve ever made! I’ve used a few different recipes in the past and they came out okay, the texture was always off and they were always missing something. I took out the mushrooms as both myself and my boyfriend don’t love them. I was wanting to use up the rest of our spinach and broccoli before they went bad so I sautéed the spinach with the onions and garlic and added the cut up broccoli when I added the pasta and it came out cooked perfectly. I used about 1/2 cup light cream and 3/4 cup heavy cream bc I was also wanting to use it up from my fridge before they spoiled. This was seriously delicious, it tasted just like a great Italian restaurants Alfredo sauce and thats what I’ve been looking for all this time! This will definitely be a keeper, I don’t think I’ll have look for another Alfredo recipe ! I would recommend baking it in the oven. You are welcome to leave some sauce out and when preparing it for reheating adding the extra sauce on top so it does not become dry. Just made this for dinner tonight and would definitely make it again. Great recipe. I did not include the wine and I added sun dried tomatoes. Tasted great. Im a little nervous to use Pinot Grigio- Ive used it in the past and the sweetness of the wine overpowers the recipe. Great recipe! I just made it, and it tastes delicious! Thanks for sharing ??? This looks amazingly delicious. No surprise, because all you post is mouthwatering. Thanks for sharing. I have made this twice, first time like it says and the second time I changed the chicken to shrimp and the chicken broth to seafood broth. My children told me it was better than olive garden. WOW!! That is great to hear! Thank you so much for letting me know! I am so glad it was so good for all of you! Thanks for following along with me! Could you freeze this recipe? If so, would you freeze before or after baking it ? You are welcome to freeze it but sometimes it does not heat up well the best because the sauces will separate. I would recommend baking it first then freezing though. Hope that helps and it tastes great! Thanks so much for following along with me! Thank you so much for your GREAT recipes! They turn out as you say they will which is a beautiful thing… so tired of those “I followed this as written and it did not work!” I will make this for dinner tonight! Your Cinnamon Roll recipe was PERFECT! I gave some to my friend as it is her favorite and it was her birthday. THANK YOU for an EXCELLENT Blog! I have a new problem involving dairy items. My husband has become lactose intolerant. The cheesey cream base sauces I love. Even the garlic herb butter sauces I just don’t know how to make the new substitutions without losing the flavor. Please Help me…. Hmmm!! That is a tricky one! I am not sure what all to substitute for the both of you. You can still use dairy free items and add seasoning to enhance the sauce. Would that help?! I just made this for lunch and holy crap it’s good! My kids licked their plates clean. THANK YOU for your tips. I’m not confident in the kitchen and even though I’m a 40 year old woman I normally stick to steak and potatoes. This was a stretch! And an easy one. I love that you help us through each of your recipes Karina. It’s like you were cooking right here with me. Off to make your brownies now! Thank you for bringing joy back into cooking! Talia you’ve made my day! I’m so happy to read this! Thank you for sharing your feedback. I’m so happy you all enjoyed it! Kids kicking plates clean is a good sign ? What do you consider one serving for the chicken Parmesan? Thank you. I like to use myfitnesspal.com or skinnytaste.com for portion and nutrition ingredients. That would give you an accurate amount of portion and serving that you are looking for. Hope that helps you! Thanks so much for following along with me! If you omit the wine should you use broth instead? And if you do, should you adjust the amount of broth added later? Yes, you will want to add broth or another sauce to get the juices in. It will be great! I am excited to hear how it turns out! Thanks so much for following along with me!